My friend Chris came to me with a bit of an odd problem. You see he had itchy palms. Chris really wanted to know what causes itchy palms, so he could really address the root cause of the issue. That being said, there are many itchy palms causes that can make it difficult to treat the problem. The palms of your hands are a unique part of the body. The palm of the hand is also called the metacarpus or broad palm. 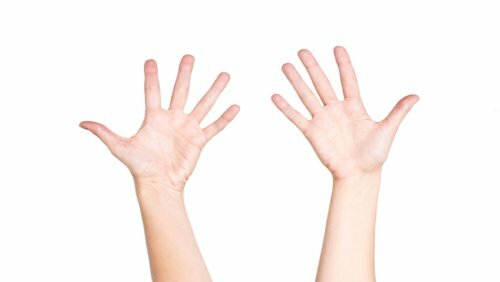 The palm has five finger bones, a wrist joint, and 17 muscles that allow the thumb and fingers to function. You use the palms the most. For example, you use your palms to drive. Without them it would be difficult to grip the steering wheel. You also use your palms to make your meals. What about for playing sports or working out? Without your palms it would be quite difficult to grip a baseball or use exercise equipment. Your palms are the most sensitive area of the body. As a result, itchy palms will make it difficult to get through those daily tasks. Dry skin will cause the skin to become dry. Inflammation, flakiness, and dryness from the skin will lead to itchy palms. Certain factors that cause dry skin include weather changes, sunlight exposure, or exposure to air-conditioning. Dry skin is also called xerosis cutis. Extremely dry skin is called dermatitis. There are four types of dermatitis, including eczema, atopic dermatitis, and contact dermatitis. Eczema is a type of dermatitis that is also called allergic dermatitis. Scaly, red, swollen, burning, and itchy palms, fingers, or skin is a common symptom with eczema. Eczema is triggered from stress, food allergies or sensitivities, an impaired immune system, low levels of gut flora, fungal overgrowth, poor detoxification, low stomach acid levels, poor digestion, and essential fatty acid deficiencies. Atopic dermatitis is considered a subtype of eczema. It is a long-term disease that can produce scaly, thick, flaky, red, and itchy palms or skin. Rashes will also appear behind the knees, on the feet, inside of elbows, and on the face. The condition is associated with hay fever and asthma. Stress may also lead to episodes of itchy palms related to atopic dermatitis. Contact dermatitis will result after exposure to an irritating foreign substance such as cosmetics, fragrances, soaps, jewelry, and plants like poison oak or poison ivy. It will cause red, inflamed, and itchy palms or skin that can be very uncomfortable. An allergic reaction is the most common causes of itchy palms. Allergies occur when the immune system mistakes a normally non-toxic substance as harmful. These substances may include detergent, pollen, and grass. The immune system responds by releasing histamines. As a result, rashes, hives, eczema, and other skin eruptions may occur, including itchy palms and skin. Poor digestion and nutritional deficiencies are potential causes of allergies or food allergies. Food allergies and sensitivities will result when the immune system reacts to foods that are normally harmless. Common food allergies include wheat, gluten, eggs, monosodium glutamate (MSG), shellfish, and peanuts. As a result, skin reactions like itchy palms are a common symptom of food sensitivities and allergies. Itchy palms causes also include carpal tunnel syndrome. The condition is caused from repetitively using the hands. People who have this problem include writers, grocery clerks, assembly-line workers, musicians, and knitters. It is thought that 10% of computer users suffer from carpal tunnel syndrome. Psoriasis will occur when skin cells grow too quickly, and the skin will replicate cells at 10 times the normal rate. Itching palms is a common sign of psoriasis, and it will also produce blisters on the palms. Other symptoms include thick, red, and dry skin, and dull, distorted nails. Psoriasis is a long-term condition that can be caused by stress, hormonal changes, poor liver function, fungal or bacterial overgrowth, protein digestion difficulty, vitamin D deficiency, and a poor diet. Primary biliary cirrhosis is a chronic liver disease. One of the early signs of the condition is itching palms and skin. It is an autoimmune disease where the bile ducts in the liver are slowly damaged, and the body turns on its own cells. The severe itchiness of the condition will manifest worst during the day or at night. Other symptoms of primary biliary cirrhosis include high cholesterol, diarrhea, hypothyroidism, jaundice, osteoporosis, and edema. Systemic lupus erythematosus (SLE) is an autoimmune disorder that will kill the body’s healthy cells. The disease can attack several parts of the body such as the heart, digestive tract, or skin. Red or itchy palms are symptoms that may occur with SLE. Also, SLE-related rashes can lead to great discomfort in people with itchy palms. Scabies is a very itchy and contagious skin condition caused by the itch mite Sarcoptes scabiei. The tiny eight-legged bug will dig into the skin. Common symptoms of scabies include a pimply rash, tiny blisters and scales, and itchy palms, fingers, wrists, armpits, or elbows. A skin problem is sometimes a sign of diabetes. Diabetes is characteristic of high blood sugar levels. For instance, eruptive xanthomatosis is a skin condition that is indicative of out-of-control diabetes. It will cause itchy palms, feet, and skin. Other symptoms of eruptive xanthomatosis include high cholesterol, and tiny, yellow, and red bumps around the skin. The combination of rolled oats and baking soda can help relieve itchy palms immediately. Try adding two cups of unprocessed rolled oats and a cup of baking soda to warm bath water. Baking soda is a natural anti-inflammatory and acid neutralizer. Oatmeal also helps to prevent irritation and sooth the skin. Lemon juice also makes for an effective home remedy for itchy palms, hands, and skin. Lemons contain anti-inflammatory and antiseptic properties that protect against the skin. To treat your itchy skin or palms simply rub a cotton pad with fresh lemon juice on your affected areas, and let them dry. Aloe vera gel makes a great skin soother with potent antifungal, antibacterial, and anti-inflammatory properties that help for itchy palms and skin. There is also evidence to support aloe vera for skin conditions. A study published in the journal Tropical Medicine & International Health in 1996 found that aloe vera treated psoriasis in a six-week experiment. A 2007 review in the International Journal of Toxicology also found that aloe vera treated eczema. Getting more essential fatty acids (EFAs) is a good way to relieve itchy palms and skin-related conditions like eczema and psoriasis. Good options of essential fatty acids include fish oil, evening primrose oil (EPO), and flaxseed oil, which all contain anti-inflammatory properties that treat skin problems. For example, EPO is loaded with gamma linoleic acid (GLA), while fish oil contains a good daily dosage of eicosapentaenoic acid (EPA). Flaxseed oil is considered an excellent plant-based source of omega-3 fatty acids. There are many essential oils with anti-inflammatory properties that help soothe itchy palms and other related irritations. You can add essential oils to your bath water or apply them to your itchy palms directly. Some essential oils known to relieve itching skin include nettle oil, basil oil, chamomile oil, chickweed oil, clove oil, calendula oil, agrimony oil, neem oil, and geranium oil. Homeopathic remedies can also help treat itchy palms or skin, and conditions that relate to the symptom. Some of the more common remedies for itchy palms with eczema include, arsenicum, mezereum, psorinum, sulphur, rhus toxicodendron, graphites, and calcarea carbonica. Acupuncture and acupressure are also considered an effective treatment for itchy palms related to skin diseases like eczema or atopic dermatitis. In a study published in Acupuncture Medicine in 2012, acupressure for four weeks improved the itchiness in patients with atopic dermatitis. Another study published in the Journal of Alternative and Complementary Medicine in 2011 found that acupuncture treatment reduced the itching intensity in eczema patients. What else can help itchy palms and skin health overall? An itchy palms treatment can also include other natural skin health remedies such as butterbur, stinging nettle, methylsulfonylmethane (MSM), eyebright, probiotics, vitamin E, burdock root, boswellia, vitamin A, zinc, dandelion root, red clover, calendula, neem oil, and vitamin D3 (cholecalciferol). Quercetin and vitamin C are also supplements with a natural antihistamine effect, and they are useful when allergies are the cause of itchy palms. Vitamin B6 can also reduce nerve-inflammation and the itchy palms associated with carpal tunnel syndrome. It is also important to note that certain medications can trigger psoriasis symptoms like itchy palms. It is a good idea to talk to your doctor about replacements for lithium, beta-blockers, chloroquine, and non-steroidal anti-inflammatory drugs (NSAIDs). Also, candida can cause many skin problems like eczema, psoriasis, and allergies, which trigger itchy palms. In this scenario it is best to get specific treatment for candida. Balch, J., et al., Prescription for Natural Cures: A Self-Care Guide for Treating Health Problems with Natural Remedies Including Diet, Nutrition, Supplements, and Other Holistic Methods (Hoboken: John Wiley & Sons, Inc., 2004), 28-32, 142-143, 197-198, 264-265. Syed, T.A., et al., “Management of psoriasis with Aloe vera extract in a hydrophilic cream: a placebo-controlled, double-blind study,” Tropical Medicine & International Health, 1996; 1(4): 505-509. Pfab, F., et al., “Effect of acupuncture on allergen-induced basophil activation in patients with atopic eczema: a pilot trial,” Journal of Alternative and Complementary Medicine, 2011; 17(4): 309-314, doi: 10.1089/acm.2009.0684. Lee, K.C., et al., “Effectiveness of acupressure on pruritus and lichenification associated with atopic dermatitis: a pilot trial,” Acupuncture Medicine, 2012; 30(1): 8-11, doi: 10.1136/acupmed-2011-010088. “7 Home Remedies for Itchy Skin,” YouQueen web site, July 22, 2012; http://youqueen.com/beauty/skin-care/7-home-remedies-for-itchy-skin/. “Itchy Palms: Possible Causes and Treatments,” Med-Health.net; http://www.med-health.net/Itchy-Palms.html, last accessed January 21, 2016.